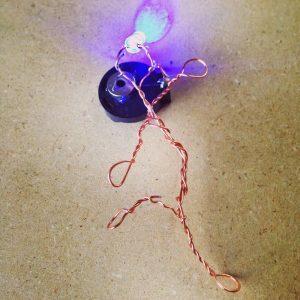 A quick and easy way to make light-up pin people! There are endless possibilities for variations on this basic concept. 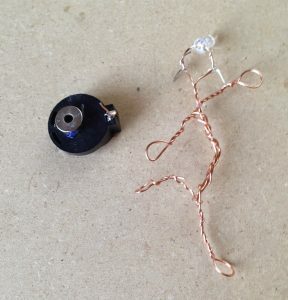 This method uses magnets to serve two purposes: to hold up the LED + wire pin person and to connect the negative LED leg to the battery. Wire Any type that is solid core, preferably insulating or w/ insulation. 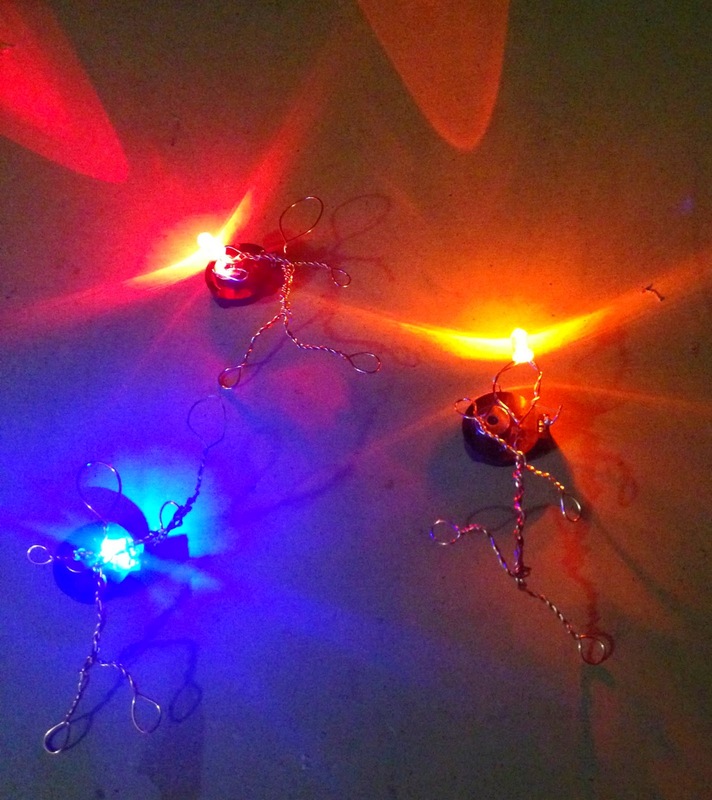 If you do use conductive wire, you can modify the design to incorporate it into the battery switch mechanism. Magnet Be sure to get a strong magnet that will hold the weight of your pin person + LED. Rare earth/Neodynium are ideal. After a variety of methods, this was the one that worked best for me. 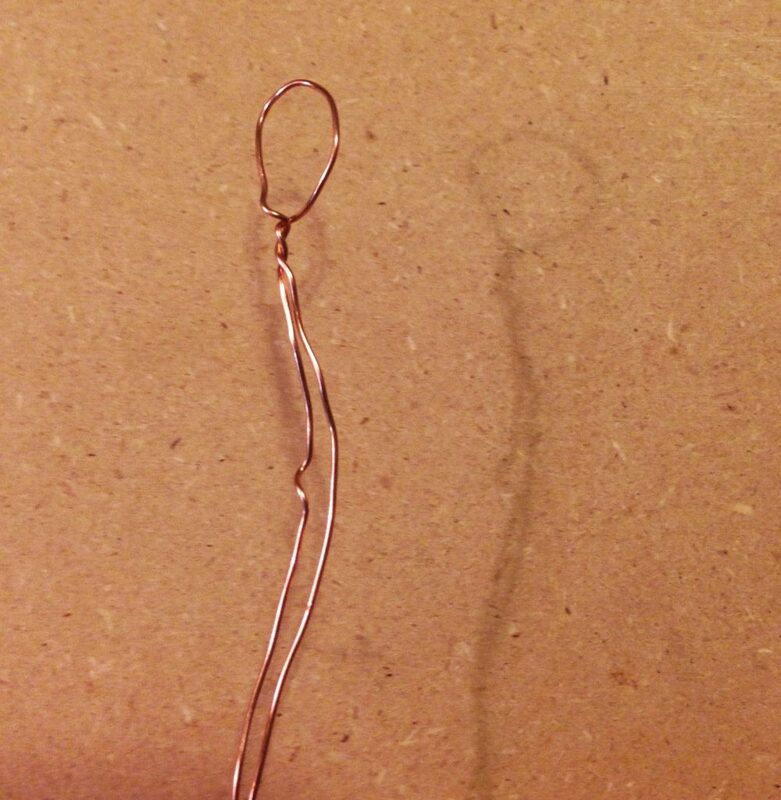 It is studier than wire, and works perfectly for a backing of the pin. 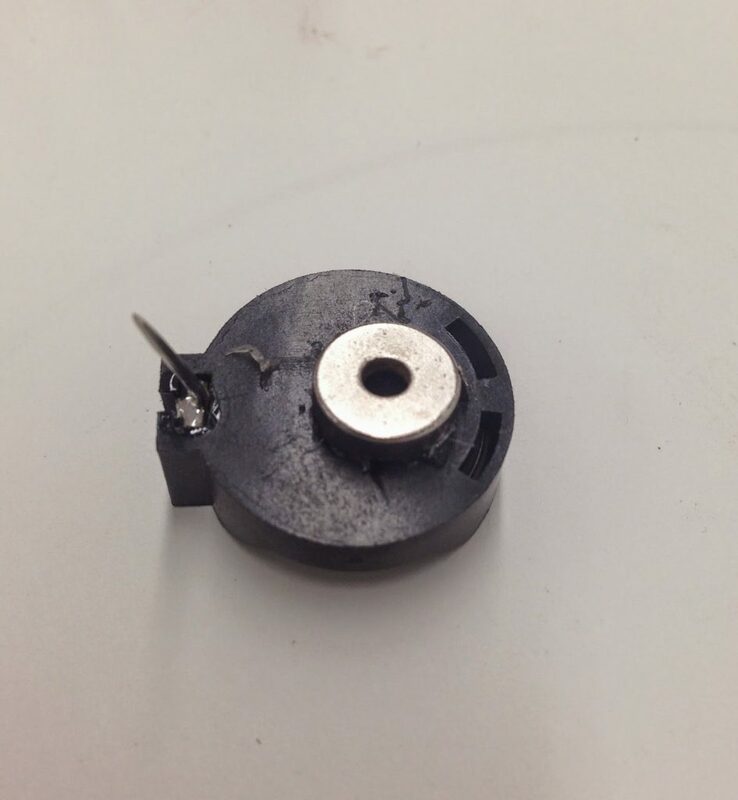 To make a simple cap for the sharp point, dab some hot glue onto the wire person or use pliers to re-use the cover on the original safety pin. Soldering iron This was only used for the safety pin + positive battery connection. 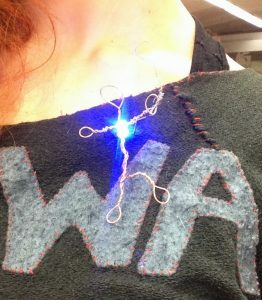 If unavailable, can use hot glue to hold the safety pin in place but be sure to maintain electrical connectivity. 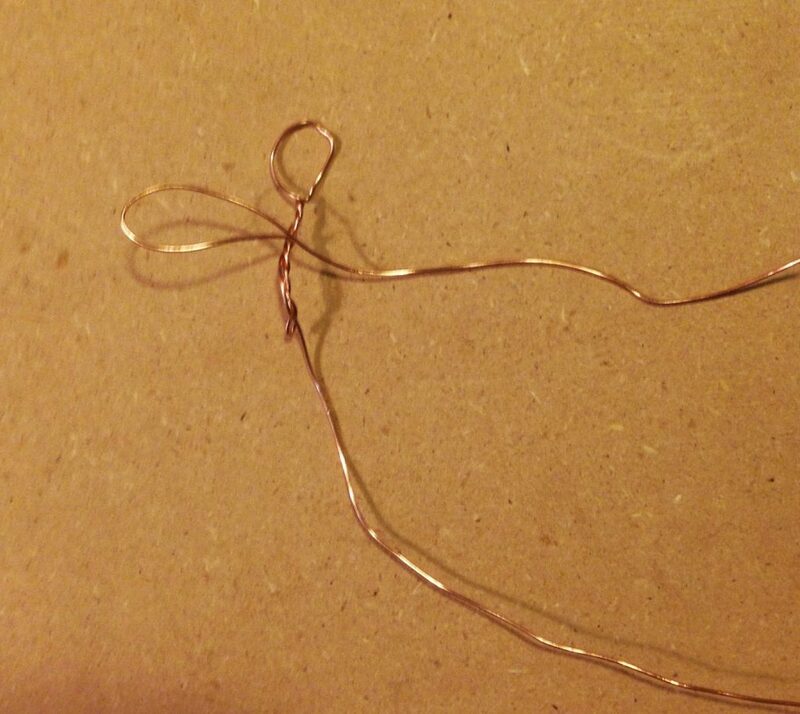 Make a loop in the middle of the wire and twist for ~ 1 inch. 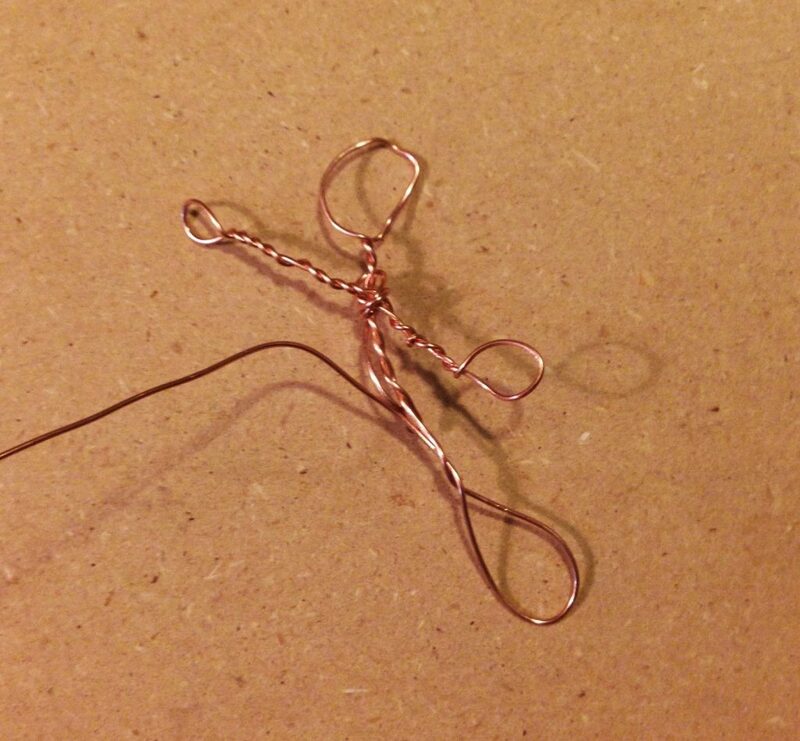 Shape the arms and hands; make a loop ~ 1 inch beyond the torso and twist wires together. Wrap once around the body, then make the other arm and hand. Shape the legs + feet in the same way as the arms but make them slightly longer. 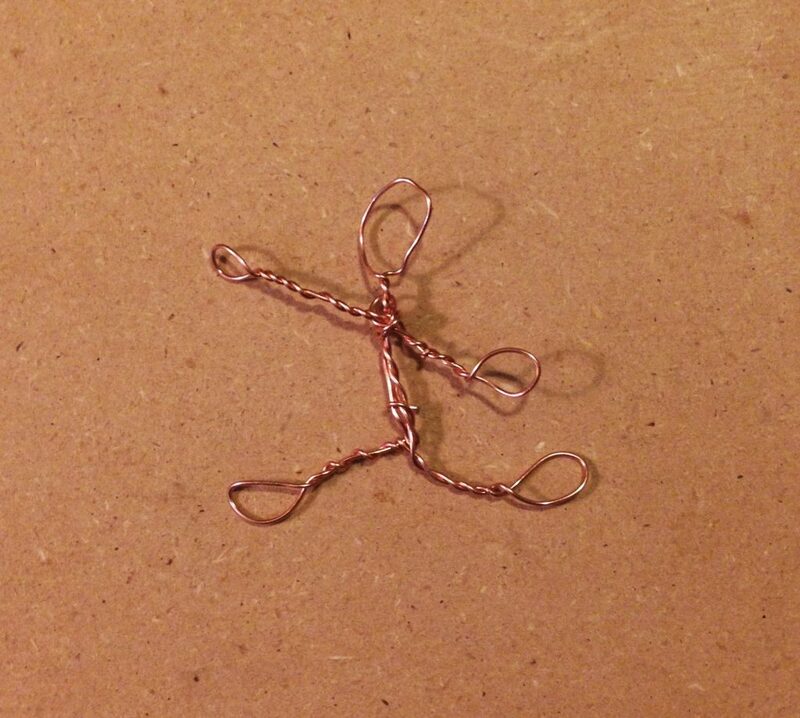 Position the wire person into desired motion; running, rock climbing, walking a dog, etc. Solder the clipped safety pin end to the positive battery clip lead. 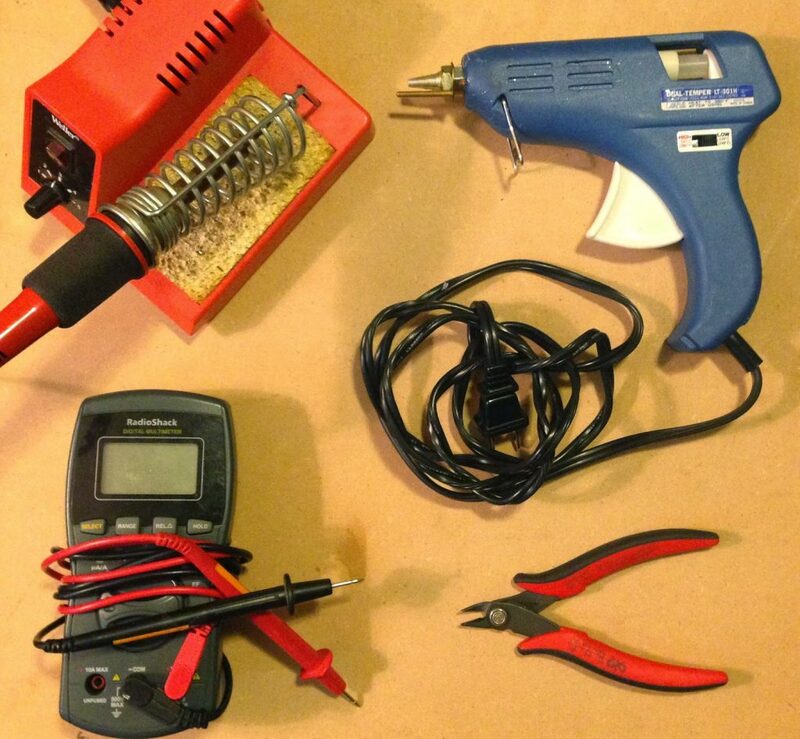 If soldering iron isn’t available, use hot glue to secure the safety pin end in place. 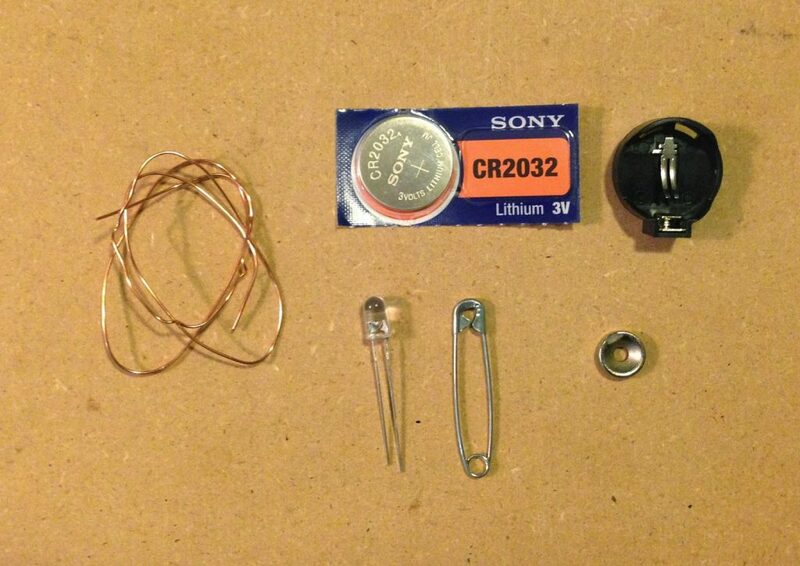 Place the magnet so that it touches the negative battery clip lead. Hot glue it in place. You may need to bend the battery lead into the magnet a bit. Check connections by touching the LED to the magnet + safety pin. The longer LED leg is the positive side. Determine where you want to place the LED. Maybe your pin person has accessories, like a flashlight, and it would make sense for the LED to go there. Cool! Go for it. Mark the negative side of the LED with a sharpie. 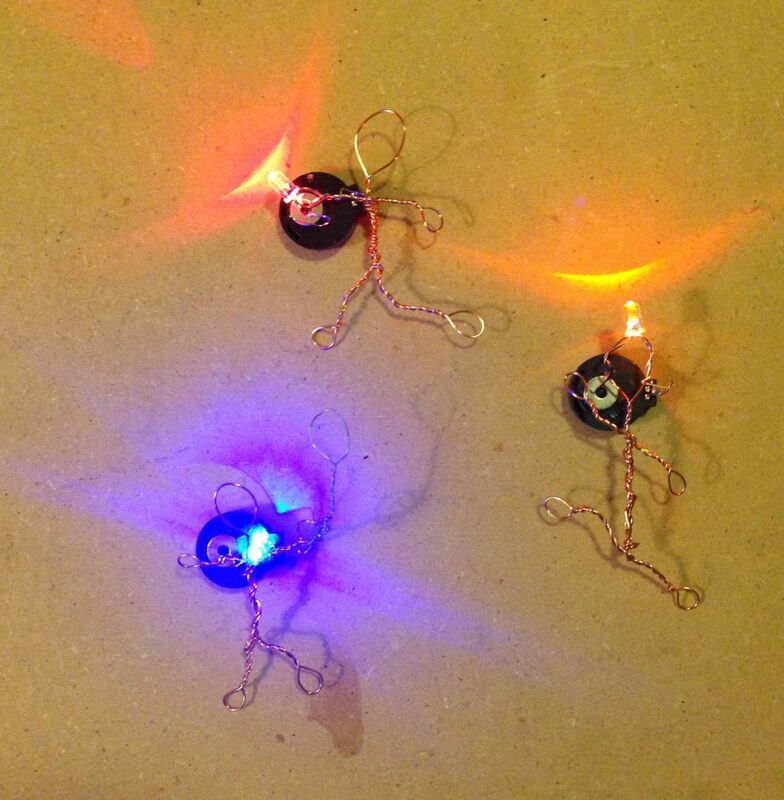 Twist the LED legs onto the pin person, leaving ~ 1/4 in of each leg sticking out. Be sure that the LED legs are insulated (aka not touching). 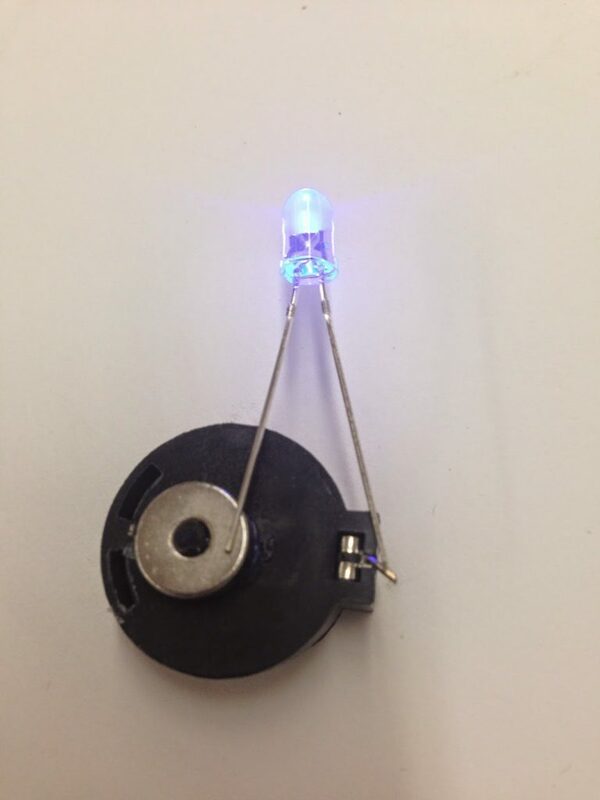 Using the battery clip, orient the LED legs so that the negative leg connects with the magnet and the positive leg rests on the safety pin. That’s it! Super simple and tons of possible extensions with all the random stuff you can find around the house. Happy building!